The Coastal 650 has a prominent forefoot and deep vee entry. 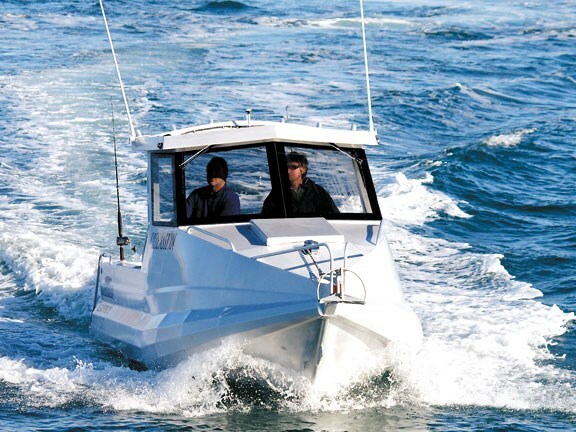 The 650HT starts at 40 degrees forward and has a progressive run aft to the 21 degree deadrise at the transom. There’s also a three-degree keel drop as it goes forward. The pontoons also protrude 100mm below the hull plating for lift and tracking ability. Obseassion, the test 650 HT, is the 46th boat to emerge from Keith Blowe’s one man workshop in the south Taranaki township of Manaia. "Every one of my boats is different," he says. "There’s nothing hard and fast. I tend to start a boat with no finished product in mind – they develop one stage at a time." The Coastal range started 2 ½ years ago with a 3.8m pontoon boat, designed and built for hard use and beach launching into the Tasman sea swells. 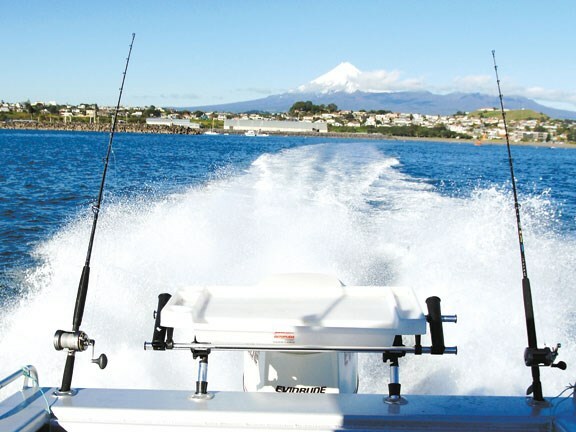 A 7m console boat with 5.7-litre V8 Mercruiser diesel is being built for a client to take game fishing and a 9m Coastal has been ordered for a New Plymouth commercial operator. "People ring me all the time with ideas for improving their boats – some really good ideas. I’ll give them a go and, if they work, incorporate them in subsequent vessels." Dwayne Bennett, owner of Obseassion, has a young family and wanted a deeper cockpit area for security, so the sides were raised from the standard 750mm to 850. Otherwise Obseassion is all Coastal, right from the 6mm aluminium boat channel that forms the backbone of the boat. Four, full-length welds stick the boat channel to the 650’s 5mm hull plating, and 36kg of welding wire is used. That welding wire’s gluing together a lot of high grade 5083 – H32 marine alloy. Frames are 50mm by 4.5mm spread every 600mm throughout the 650 and backed up by diagonal braces. A full bulkhead transverses the boat at the forward end of the cockpit to "stop any tendency to twist", Blowes says. Full length 50mm by 4.5mm stringers are welded at 160mm centres and the pontoons are made of 3mm alloy with half frames every 600mm and three watertight bulkheads. The 650 Hardtop weighs 1220kg (dry) on the trailer. 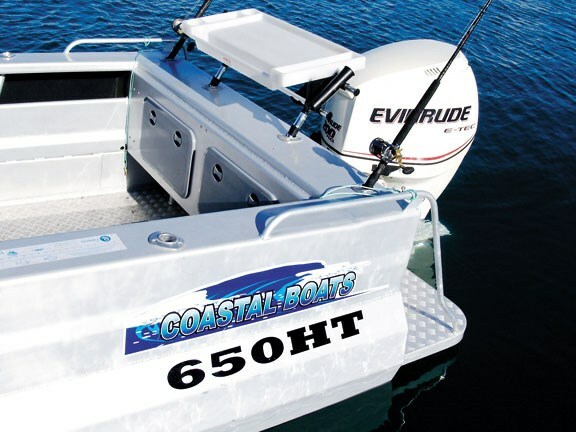 Obseassion’s 238kg, Evinrude E-Tec 200 HO (High Output) power plant is mounted on a watertight pod welded to the transom platform. 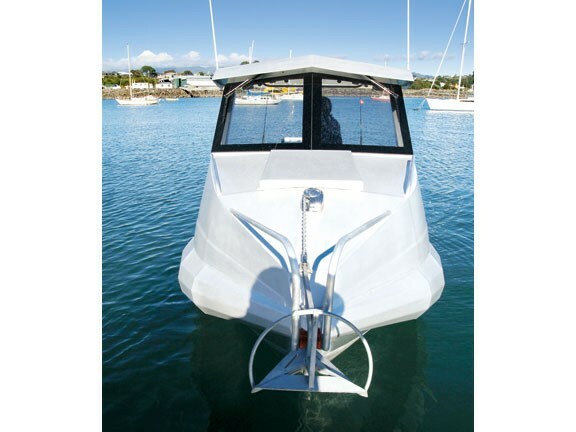 Obseassion is fitted with Volvo BTS (Boat Trim System) 300 trim tabs to help the boat’s easy motion. Watertight compartments in the transom house a battery to keep power up to the Volvo system, as well as a start battery, fuel filter and oil tank with enough space left for tools or fishing gear. Fuel is drawn from a 200-litre tank welded to the bottom of the 4mm alloy treadplate (which makes up the cockpit sole) and is completely independent of the boat’s bottom. 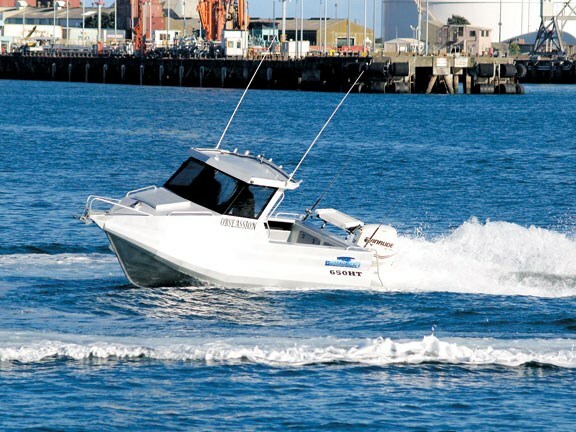 Top speed by GPS was 40 knots (74kph) at 5800rpm and the Lowrance engine monitor showed about 67 litres of petrol per hour disappearing into the hardworking two-stroke. A more relaxed 3500rpm had the boat loafing along at a comfortable 30 knots (56kph) on 25 liters per hour. For the Coastal 650’s hard top, Blowes fabricated his own 5mm thick vee shaped marine alloy box section pillars with 3mm plate to fill in the gaps, making it very sturdy. Head room is excellent and visibility through the 8mm reinforced and tinted glass windows is good. 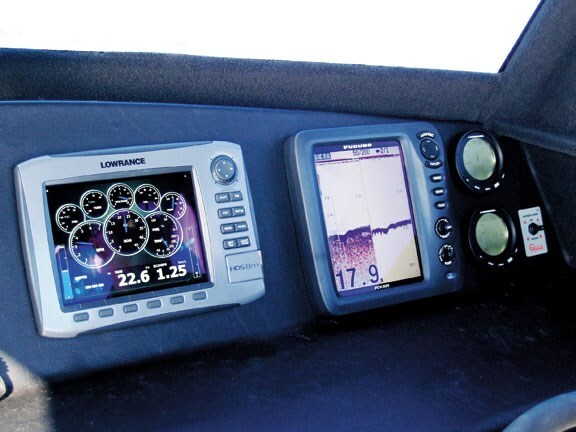 The Lowrance HDS 8M fish finder also shows GPS and engine data and a Furuno FGV 385 Depth Sounder supplies in depth info on the sea floor. The vinyl-covered dashboard has room for lots more electronics. 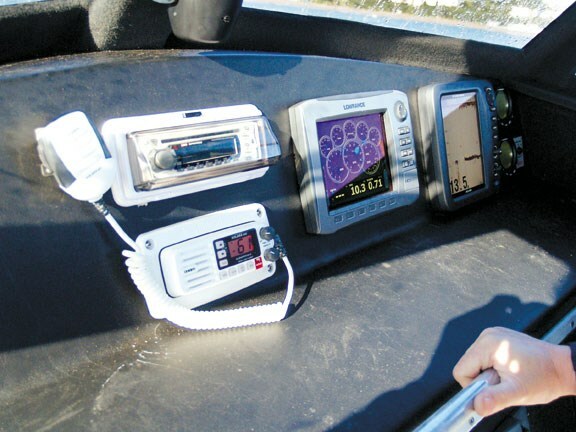 Obseassion is primed for fishing; the rocket launcher is primed with seven rod holders, there are three more either side of the cockpit and another two on either side of the plastic bait board mounted on the transom.